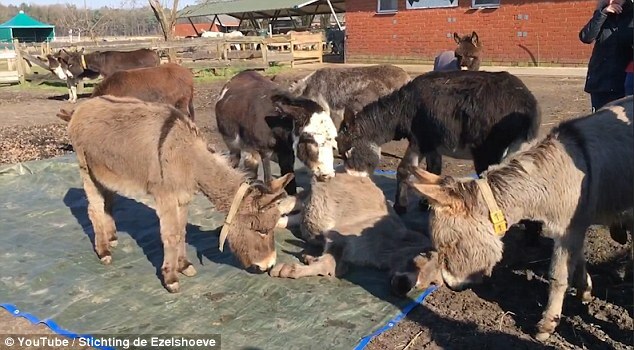 A herd of donkeys shared a heartbreaking moment as they brayed in unison over the body of a fallen friend. Bram the donkey was rescued by the Stichting de Ezelshoeve animal sanctuary in the Netherlands two years ago. He was found severely neglected, with his hooves and lungs damaged beyond repair. "We knew that he was very sick and it was just a matter of time," the rescue's founder Jacqueline van den Berg told CBS News. "All we could do was give him medication, nurse him, and give him all our love." All animals have a range of emotions that have proven to be more complex than many humans could have imagined. The question is not if they have emotions but why exactly they have evolved like they have. Emotions are passed down from ancestors and as such, they help enable the survival of a particular species. This applies to other animals just like it applies to humans. Yes, humans have complex emotions, just like pigs, dolphins, elephants and the rest of our animal friends. Responses to "Heartbroken Herd of Donkeys Cry Loudly Over the Body of Fallen Friend"